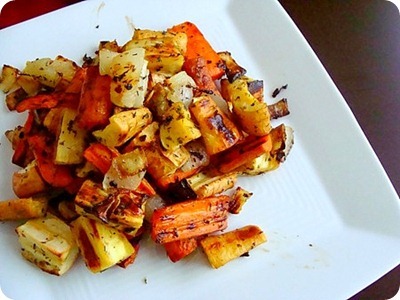 Since parsnips and carrots are related it only makes sense to combine them into a simple yet delightful side dish. Wash and peel carrots and parsnips and cut into bite size pieces. Mince the garlic and rough chop onion into large pieces. 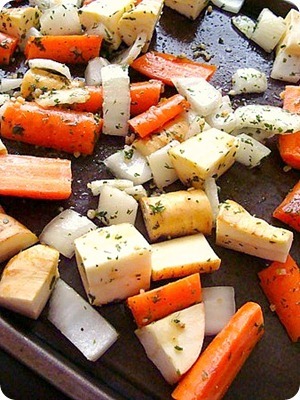 Add all of the vegetables in a mixing bowl, then add oil and salt and pepper. Toss to evenly coat. Spread on a baking sheet and place in oven for 20-25 minutes, tossing them once at about 10-12 minutes. This entry was posted in side dish, vegan, vegetarian. Bookmark the permalink.